In the last years of Kurmanbek Bakiev’s rule the organization of demonstrations in Kyrgyzstan was resisted in all possible ways. The legal acts on running peaceful demonstrations were totally made more severe. For instance, the organizers of demonstrations must have informed the authorities about the meeting 12 days in advance. The meetings were allowed only in special places. Often times, against legal norms the law enforcement officers were detaining the member of political protests. The number of demonstrations dropped dramatically. With the change of regime in April of 2010 the situation has changed. According to main department for interior affairs press-service, in 2009 there were 74 meetings and demonstrations in Bishkek while in 9 months of 2010 there have been 222! Aziza Abdirasulova, the prominent Kyrgyz human rights advocate and the head of Kylym Shamy NGO, which has been monitoring public protests since 2003, told Ferghana.Ru about main mistakes, performance of police during the protests and the differences between present-day demonstrations and those that took place 5 years ago. In January-June of 2010 Kylym Shamy members monitored 40 peaceful demonstrations. Aziza Abdirasulova: We have to clearly define what we mean by "peaceful demonstrations" and how they impact the public order. Not all the meetings can be referred as peaceful. The peaceful meeting means no violence. The international practice says that if there is no violence during the meeting it is a peaceful one. Aziza Abdirasulova: - If during the meeting there is at least minimum element of violence the meeting is no longer peaceful. It is the responsibility of the government to ensure the security for its members and public order. If there are provokers among the meeting attendants it is the responsibility of the government to get them out of the demonstration. If the protesters need to relocate the safety of such relocation must also be ensured by the state. The attendance of the peaceful meetings is the political right of the citizens. The purpose of meeting participation is to present the problems to public and officials, making decisions on these issues. The law enforcement bodies, ensuring the security during the meeting, must make sure the peaceful demonstration reaches its goals. For example, if the protesters approached the office of Public Prosecutor, but the raised issue is solved, for instance, in the court – the law enforcement bodies must help the protesters move towards the court building. This is when the meeting reaches its goal because it will be heard by the decision-making official. This is the interaction among governmental structures, law enforcement bodies and the protesters. In Kyrgyzstan, however, it is done the other way around. - This is not the peaceful meeting, because any aggression builds ground for the violence. The demands of any meeting must reach the public and officials since this is the political action; therefore, the presence of mass media is good for the protesters. The law even says that journalists have right to attend the meetings and their security is the responsibility of the law enforcement bodies. Moreover, any person has a right to attend the meeting. - What is your opinion about the initiative of Felix Kulov on hiring the cavaliers for the security purposes during the meeting? - Felix Kulov is wrong. The presence of cavaliers is accepted by the human rights officers as the frightening sign. The horses are not manageable and they can smash people. Besides, 200 cavaliers in Bishkek create insanitary conditions. We, human rights activists, may protect the peaceful meetings only. The organizers bear moral responsibility for the safety of the people, while Felix Kulov, Omurbek Suvanaliev, Melis Eshimkanov used to detain the meeting members. At that time we were supporting Cholpon Djakupova, Asia Sasykbaeva and four other protesters in the court while the organizers did nothing. The posters, shown during the meetings, may become the weapon anytime. I believe these posters must not be put on such sticks in Kyrgyzstan. There should be no glass bottles and drunken people. Police cannot check every bag; therefore, the meeting organizers must bear responsibility for these elements. - Why are there so many protests in Kyrgyzstan? - First, our society is politically motivated; any meeting is the political action. Second, we have low level of legal culture. Before attending the meeting, the person can address certain issues to appropriate agencies, local authorities. In order to write the statement, addressed to the official, one needs time and skills to correctly put his ideas on paper. This is most efficient way. I always ask the meeting attendants where they go before the meeting. I am happy when people show me the papers and tell where they went; I see their problems were not properly solved. I understand and support these people and offer my assistance. Another story is when people go straight to the meeting. This is their right, but I always advice them to solve the problems, addressing the right governmental bodies. According to the Interior Ministry press-service, there were 450 protests in Kyrgyzstan in 2010. Of them, 222 protests took place in Bishkek. Among the organizers of the protests there are leaders of NGOs, political parties and other public organizations. 124 protests included political demands, while other 98 announced socio-economic needs. For comparison: in 2009 there were 74 protests in Bishkek, including 32 political demands, 38 – socio-economic, and 4 other needs. - What has changed after the resignation of Kurmanbek Bakiev? - In the last year of Bakiev’s rule nobody had a right to protest. For instance, when Ondorush Toktonazarov (the leader of Azattyk radio listeners) several times defended the Azattyk radio through the meetings he was always detained. Human rights advocate Maxim Kuleshov was also always detained. Four human rights defenders, including me, were detained in the first day, following the presidential elections of 2009, when we tried to cover the meeting of the opposition forces (against all laws, they were judged in the military unit with no lawyers). On the following day, when we chained our hands to the fence of the White House, we were taken by police again. After the change of the ruling regime the situation has changed. Today, we observe Meken Sheyitteri and Aikol Ala-Too sitting at the main square for almost one month (these people protest against the mandates of deputies from Ata-Jurt – editorial note). This is their right as long as this is peaceful demonstration. Butun Kyrgyzstan can also organize protests. For example, I can go to the square and demand Roza Otunbaeva to paint the sky in orange colors. I can express my opinion as long as I cause no harm and do not urge to overthrow the constitutional system or incite the ethnic hatred. Nonetheless, we need to consider the realistic side of my will to change the color of the sky and the demand of Meken Sheyitteri not to allow Ata-Jurt in the parliament. We observed the wave of meetings after overthrowing Askar Akaev in 2005. This always happens because after overthrowing the regime we face even more problems and political issues. Therefore, this was expected to happen this year. Nevertheless, strict laws will not save Kyrgyzstan from meetings and protests. Therefore, the government must practice another approach: not to prohibit the protests but to solve public problems. - How did the meetings change since 2003? When did Special women’s task force (SWTF) emerge? - In 2004 Petr Tyablin was the deputy head of interior affairs department in Bishkek. He was the first to use SWTF against the human rights advocates, the supporters of Felix Kulov: women unexpectedly showed up at the meetings, destabilized the situation and left. In February-March of 2005 we were defending Respublika newspaper and had to deal with these women against us. SWTF undermined the meetings. They had to be brought to trial for hooliganism and violence. We can still observe these people. The lawyers in Osh complain that the groups of people show up in the court rooms and provoke the crowd. Today’s meetings are more aggressive. Five years ago the human rights advocate could easily stay in the crowd and hand out special brochures, outlining how to behave during the meeting, cooperate with police and what the organizers must know if case of detention, which IDs they need to have and how NGO can help in case of illegal detention. We were also disseminating the same brochures, saying how to work with meeting members and organizers, among police officers. Today, we abstain from attending some meetings because there is too much aggression; people do not want to hear about laws, norms and responsibility. Today, it is more difficult to work with population groups. I believe this is not only the responsibility of human rights advocates, but the responsibility of every political party to work with its electorate; all local authorities in the villages must be involved in this campaign because during recent political turmoil there were more young men, coming from villages. They call pogroms as meetings, they call arson as meeting…They take away arms from the law enforcement officers – they view it as meeting. I suppose we need state initiative here – people must be informed what the peaceful meeting is all about. I would like to underline that the meeting organizers must well formulate their demands. In 2004 there was a big water problem in Kadamzhai and I was asked to come to their demonstration. At that day the protesters demanded the resignation of akim (local governor). We told akim about the problem. He asked where these demands were written down. "No, they want to take over my position!" Indeed, the posters had "Akim must leave!" sign, but no message about the needed water. We bought paper and put "H20" sign there and passed them to the protesters. After that the local officials met people and akim realized they demanded water but not his resignation. Besides correct formulation of demands, the protesters must also prepare alternative solutions. For instance, I have been demanding to reform state service for national security for three years now. How to do it is another issue and I must propose certain solutions. Another example is if people want me to resign. Why should I do it? There must be division here: if the group of people believes the person cannot hold the position and perform professional duties, the only solution is his resignation. However, they must not demand him to do something else. Aziza Abdirasulova started the human rights mission in 2000 when there were mass falsifications of parliamentary election results. Ms Abdirasulova, as part-time correspondent of Respublika opposition newspaper, was placed in the local police precinct for two days because of her participation in the meeting. In 2002 Ms Abdirasulova was elected as secretary of the prisoner of conscious group. In the same year she started defending the politicians under pressure. Demanding the release of deputy Beknazarov, Abdirasulova announced the hunger strike and was later on placed in hospital. On March 17, 2002 over 200 people attended the meeting in Aksy, demanding the release of Azimbek Beknazarov. The police fired at people. Ms Abdirasulova was actively involved in this case as human rights defendant. 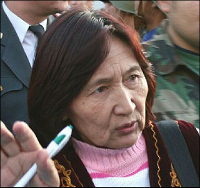 In May of 2007 Aziza Abdirasulova held the number of protests in support of O. Suvanaliev, O. Abdrakhmanov and A. Aytikeev. In 2003 Ms Abdirasulova registered Kylym Shamy human rights organization. She started analyzing the law on peaceful meetings that was restricting civil rights for the freedom of peaceful assembly. She managed to lobby the abolition of the number of norms, limiting such freedom. Today, Aziza Abdirasulova is the member of the Expert group on development of new draft law on peaceful meetings. Since 2003 she has protected over 1000 detained citizens. In any democratic state the person must feel the responsibility for its state and those problems, he is raising; besides, he must think how to develop solutions. If I see garbage around me I must not see the mayor and tell him to clean up, but rather I should it myself and propose the mayor my vision of cleaning program. If we practice such approach, we will have less protests and more useful work. - Is free will expression (meeting) possible without disturbing others? - Yes, the observance of one right must not limit the rights of other people. For instance, five thousand people disturb people around, including the drivers, pedestrians. On the other hand, we still tolerate the presidential cortege twice a day, when police blocks the road for drivers and pedestrians. Sometimes, the observance of someone’s rights violates the rights of others. During Aksy events we marched from Aksy to Osh, from Tash-Kumyr to Bishkek. I admire this non-violent march while during the march attendants made no harm to others and the government ensured their safety. When the United opposition started the meetings in Bishkek they brought sound amplifiers and the residents filed many complaints about it. During the day time the protesters were disturbing the employees of local offices. The human rights advocates urged the protesters not to disturb other people by limiting the sounds. The continuous meetings of the United opposition involved many violations that could be avoided. On the other hand, while marching the protesters produce no harm. The current law on meetings does not consider such things but I believe that we will improve these things. - What other peaceful meeting limits must be reflected in the law? - The limitation of meeting places. The law must not say where the meetings can be held; rather, it should indicate where it is not allowed to meet: dangerous zones, railroads, strategic highways and so on. Secondly, there must be time limit. During some protests people stand with posters and say nothing. However, if the meeting is accompanied by loud music it must have time limit. The route of the protesters must not block the roads. - What would you say about the performance of the law enforcement officers during the meetings? - They always ensure the security of the protesters. However, sometimes there are too many protesters and situations, when police forces cannot do much (for example, the day of overthrowing Bakiev). The police do a good job when the meeting is peaceful. However, when the meeting turns into conflict the police call for additional forces and detain people, undermining public order. There must be another group of law enforcement officers. The cooperation between the convoy group and detaining group is not perfect yet. Ordinarily, during the protests the police attract special task forces and patrol and duty point service. I believe the special group from law enforcement structures must ensure the safety of the protesters and public order during such mass demonstrations in Kyrgyzstan. These must be people that can negotiate with the parties if they see that the meeting gains aggressive signs. They must establish the right contact with the protesters and, not attracting much attention, get the provokers out of the crowd. This is a challenging task and, today, our police are not ready for that. - Many protests in Kyrgyzstan are sponsored. How to deal with this issue? - We studied this phenomenon. Our people need money. When they are offered 500 or 1000 som in exchange of involvement in the meeting they take money. On the other hand, sometimes the organizers compensate the financial expenses of protesters (taxi, food). I cannot say if this is right or wrong. It all depends on socio-economic conditions. Undoubtedly, many people do not want to attend the meetings and meet journalists…If people are motivated by their own initiatives they will meet mass media and share about their problems. Otherwise, they have nothing to tell. - Kyrgyzstan has law On citizens right to gather peacefully, with no arms and freely attend meetings and demonstrations that contradicts the Constitution on many points. What could you say about new draft law on peaceful meetings? This draft law was evaluated by the Venetian commission and will be proposed to the parliament as soon as its starts sessions. There may be debates, but I hope that the adoption of this draft law will make life easier both for organizers and law enforcement bodies. There is still a point about advance notice (according to current legislation, the meeting organizers must inform about the demonstration 12 days in advance – editorial note). The thing is that the law enforcement officers must be ready to ensure the safety of the protesters and public order. Secondly, the law enforcement structures must be ready to solve the raised issues. At the same time, the new draft law assumes right for the spontaneous meetings and counter-demonstrations. It says that local authorities are not able to prohibit the meetings; this issue must be resolved through the courts within indicated period of time. I also raised the issue about the right of prisoners to organize demonstrations. I did not mean that the demonstrations must take place in jails. I meant the freedom for organization of meetings outside. For instance, if the political leader is put in jail he must have right (even being in prison) to organize the meeting of his supporters, legally instructing them and sharing his own opinion on how to organize the meeting. The prisoner himself may not attend the protest, but he should have right to organize it. I do not know whether this point is included in the draft law, but I definitely think it is worth raising it.